Place de Tertre is not any place. It’s the scene of a recent drama called “Paris against the rest of the world”. The rest of the world in this case is: Starbucks. 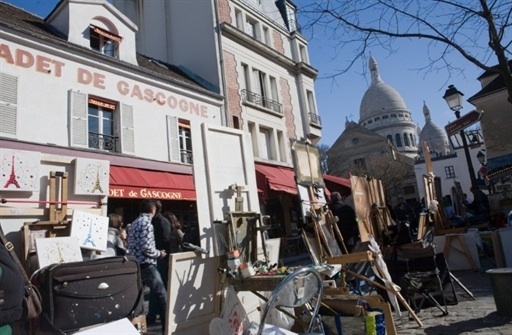 The American coffee chain wants to implant a venue right on Place de Tertre, located on the top of Montmartre, populated by painters who will do your portrait for a few bugs, a place visited by not less than 10 million tourists every year. In other words: Place de Tertre is the epitome of Paris. Or, if you prefer, it’s its cliché. This is as Parisian as it can get in the imagination of Paris lovers. 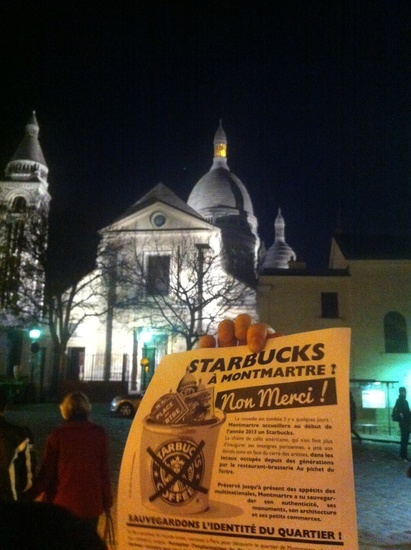 Starbucks on Place de Tertre? So what, you might object. They have Starbucks in Ho Chi Minh City, why not here? But this means to reckon without the Parisians. There are heavy protests against the project. They consider this place too Parisian to abandon it to an American chain. “C’est un géant de la malbouffe!”, says Eric Timmermans from the association Paris Fierté – which simply means: Parisian Proud. In other words: For them, Starbucks is a giant of the food industry, one of the worst representatives of globalized muck. To put it short: It’s not meant to be there. And you can even sign a petition! Parisian Proud? Yes, they are proud to be Parisian and, I agree, they have all the reasons to be. But when it comes to keeping it authentic, it looks like a waste of effort. There are already 70 Starbucks in and around Paris. All “caffeine, sugar and hypocrisy” (Timmermans again). Really? Beside the fact that a so called coffee easily can have as much calories as a whole pizza (ok, I’m exaggerating a little bit), the cakes, sandwiches and salads they propose are not exactly what you would call muck. But this is about symbols. This is about the very French and vain desire to keep away from globalisation. To keep Paris as paradise. It sounds naïve from outside. But think a bit: Do you really want to run into the same spots no matter where you are, no matter if it’s Philadelphia or Paris? No. You don’t, I bet. But the client is king. He decides. And than, cross your heart, you see a Starbucks in Paris and what do you do? You walk in, you’ll order you tall something with all the toppings you can imagine just because it feels so good, so familiar.